Who will counsel MLB, union to avoid labor strife? Will the Los Angeles Dodgers kick their pursuit of Bryce Harper into high gear? Did you see BIZARRE thing Sir Alex Ferguson did on pitch before Barcelona vs Man Utd? Barcelona penalty: Do these pictures prove VAR WRONG to overturn decision against Man Utd? PHILADELPHIA — The shadows had just about overtaken Lincoln Financial Field Sunday afternoon as the Eagles’ offense trotted onto the field late in the third quarter. There was just a sliver of sunlight left, and Nick Foles, positioned in shotgun formation, was standing right in it. The visual effect was that his silhouette stretched for more than 10 yards, beyond the Houston Texans‘ defensive front. Larger than life. Foles took the snap, stepped up in the pocket and threw it as far as he was physically able. Nelson Agholor plucked it out of the sky in stride and raced into the end zone unchallenged, finishing the 83-yard go-ahead score with a backward plunge a la DeSean Jackson against Dallas back in 2010. The dazzling impression Foles made on the Lincoln Financial Field crowd Sunday in a dramatic 32-30 win over Houston was likely his last. There is a real chance he has played his final home game in an Eagles uniform. It was not lost on Foles, who got choked up talking about it afterward. Foles’ performance only enhanced his legend. He established a franchise record with 471 passing yards and became the first Eagles QB with 400 pass yards and four touchdowns in a single game since … well, Nick Foles, who turned the trick in 2013 when he went for 406 yards and seven TDs in Oakland. The moment most likely to stick permanently with fans and teammates was one that started with a scare. Foles was drilled in the chest by Jadeveon Clowney late in the game and lay on his back in the end zone for several minutes. 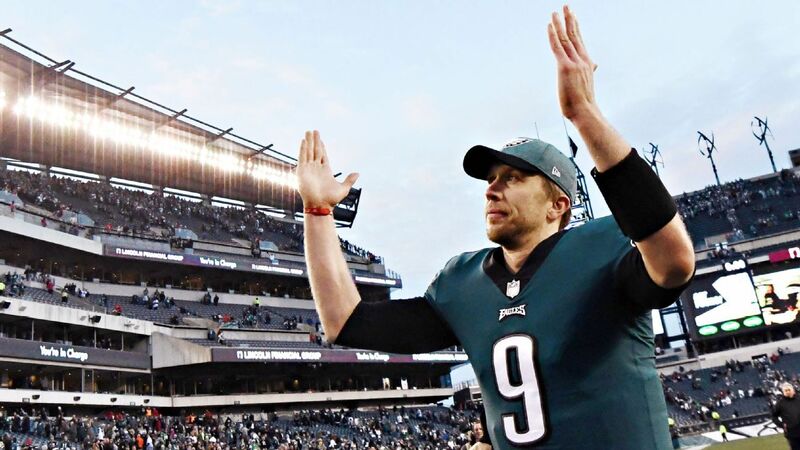 Chants of “Foles!” began echoing through the stadium, encouraging him to get up. Eventually he did, and the crowd went nuts. Nate Sudfeld went in to replace him, and thought it might be a long-term gig. It was one play. Foles got right back into the lineup and led the Eagles down the field, setting up Jake Elliott‘s game-winning 35-yard field goal as time expired. The Eagles have won two in a row since Foles replaced the injured Carson Wentz in the lineup, both coming against first-place teams in the Los Angeles Rams and Texans. The offense scored 30-plus points in both wins after hitting that mark just once over the first 13 games. The debate in Philly regarding the city’s two gifted QBs, Wentz and Foles, will pick up this week. Are the Eagles, who named Foles the starter for Sunday’s game against Washington, definitely going to let the Super Bowl MVP walk, even if his hot hand continues into the postseason? For all of the oxygen that will be spent on this topic, the reality is that this is, and should be, Wentz’s team for the long haul. Foles will most likely will be in a different city next year with a chance to cement himself as a franchise QB. He has helped his chances with his performance over the past two weeks, while stirring the imagination of the Eagles’ fan base one last time. “I’m very grateful for every opportunity to play here, to play in front of our fans, to wear that jersey no matter what,” Foles said. “No one can take that away from me. 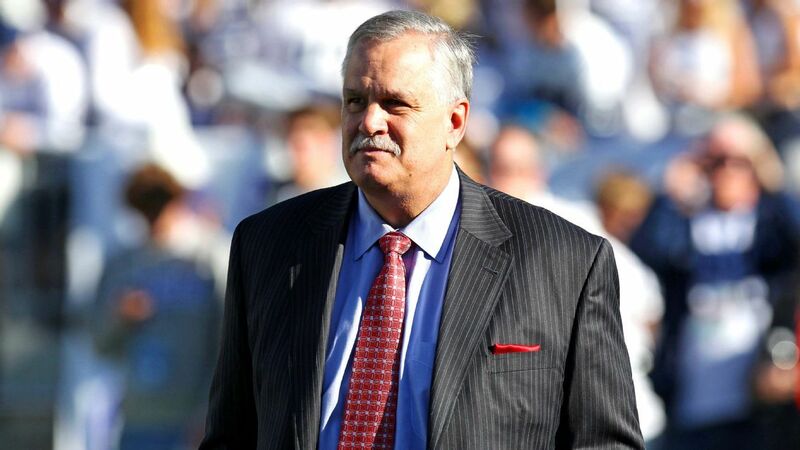 Former NFL linebacker and Detroit Lions general manager Matt Millen has undergone a successful heart transplant and is currently recovering in a New Jersey hospital. Prior to the surgery, Matt Millen told NBC Sports that the transplant was set to begin at 1 a.m. ET and would take up to six hours. Millen has been suffering from amyloidosis, a rare disease that necessitated the surgery. In October, Millen stepped away from his work as a broadcaster with the Big Ten Network to focus on his health. A former ESPN employee, Millen had been in the hospital for nearly three months waiting for a transplant. Millen, 60, went public about his disease in April, when he told the Morning Call of Allentown, Pennsylvania, that his heart was working at 30 percent of its capacity. Amyloidosis occurs when amyloid builds up in bone marrow and spreads to organs and other body tissue. As it does, it can cause organs to fail. The Mayo Clinic has reported that 70 percent of people diagnosed with amyloidosis are men between the ages of 60 and 70. A second-round pick by the Raiders out of Penn State in 1980, Millen was a linebacker for 12 season in the NFL for Oakland, San Francisco and Washington. He was an All-Pro twice and a Pro Bowler once and won four Super Bowls. After becoming a broadcaster following his playing days, Millen was hired by the Lions in 2001 to become team president and general manager. Detriot fired Millen in the middle of the 2008 season — a year that ended with the league’s first 0-16 campaign. Information from ESPN’s Michael Rothstein was used in this report. TEMPE, Ariz. — Regardless of whether Steve Wilks can lead the Arizona Cardinals to a win in their season finale at Seattle, which would prevent tying the team’s worst record for the second time since 1959, the organization will have a decision to make on Sunday night or Monday morning. According to sources for ESPN’s Adam Schefter, the Cardinals are planning to part ways with him. There are more than enough reasons to support the case to move on from Wilks after one disastrous season, but there are also plenty of reasons to keep him. One major factor in the Cardinals’ decision will be quarterback Josh Rosen; Arizona traded up five spots to draft him 10th overall this year. There’s no more valuable player on the roster than Rosen, and his progress will be vital to the team’s improvement and long-term success. Any move Arizona makes will have to be made with Rosen at the forefront of its thinking. Fire him: This one is easy. The Cardinals are expected to finish 3-13, which would tie their worst record since 1959. Their offense is ranked last in yards per game and points per game. Wilks let the offense continue down a path of no return. 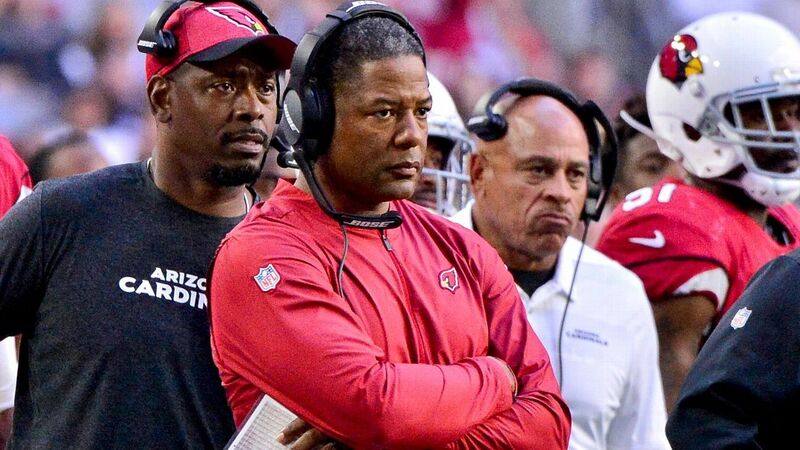 He allowed former offensive coordinator Mike McCoy to join his staff, a decision that cost the Cardinals dearly in the first seven games before Wilks fired McCoy and promoted Byron Leftwich. Firing Wilks could be a signal that the Cardinals aren’t pleased with the progress Rosen has made under Wilks’ guidance. Rosen has not thrown for more than 252 yards in a game, has once completed more than 65 percent of his passes and has been sacked 39 times. While he hasn’t shown noticeable signs of growth, Rosen also hasn’t regressed. He has basically just tried to stay healthy behind a patchwork offensive line that has forced him to run for his safety often. The defense, of which Wilks is supposed to be a master, is ranked in the bottom half in yards allowed per game and in the bottom third of points allowed per game. The run defense has given up more than 100 yards in 13 of 15 games and more than 200 in the past two. At one point, defensive players openly complained that their teammates weren’t doing what they were coached to do in games. Wilks was responsible for his staff, so when the season went south, issues with the assistants fell on Wilks. In the “buck stops here” nature of the NFL, there’s ultimately one person upon whom the results rest: the head coach. If the Cardinals feel like the future can’t be turned around quickly, then Wilks’ time in Arizona will end after one season. Keep him: While this season was a disaster nearly from the start, plenty went wrong that Wilks can’t be faulted for. Sure, if a repeat of 2018 happens in 2019, the Cardinals should fire him midseason. But there are several reasons why he should get a chance to start fresh next year. First, general manager Steve Keim was suspended for five weeks after being charged with extreme DUI, and his suspension came during training camp. Training camp is one of the most crucial times for a coach, especially a first-year head coach, to have his GM. That meant the two weren’t able to have daily discussions about the roster, which meant they weren’t necessarily able to form the roster to Wilks’ tendencies. That wasn’t Wilks’ fault. It takes more than one offseason for a new head coach, especially one who’s transitioning a defense from a 3-4 to a 4-3, to build the roster he wants. And there’s no better time to do it than in training camp. • The end for the Oakland Coliseum? McCoy’s playcalling was predictable and boring, two of the main reasons for the lack of offensive success in the Cardinals’ first seven games. The Cardinals fired McCoy after a 45-10 Week 7 blowout loss to the Denver Broncos on Thursday Night Football. McCoy, whom the Cardinals interviewed for the head-coaching position in 2013, might not have been Wilks’ No. 1 choice to be his offensive coordinator. After shrinking a significant portion of the playbook following McCoy’s departure, the Cardinals’ offense found a brief rebirth with Leftwich, who has been coaching and mentoring Rosen since he was drafted in April. It’d be intriguing to see what kind of offensive scheme and how much progress Leftwich can make with Rosen and an entire offseason to work at it. Remember, Leftwich comes from the Bruce Arians’ school of playcalling. Giving Rosen stability with a coaching staff could be critical for his immediate success. Keeping him with Leftwich for another season will give Rosen a chance to spend the offseason learning Leftwich’s system and working with a single voice. Having Leftwich continue to coach him through the ups and downs of an NFL defense, as opposed to having a new coach come in and have to start from scratch, could be the difference between Rosen making that expected improvement between his rookie season and Year 2, and not. It’s also worth pointing out that the Cardinals suffered a number of injuries this season, including to four of their five projected starting offensive linemen. The fifth, right tackle Andre Smith, was released in Week 12. Heading into the final week of the season, several Cardinals are on injured reserve, including wide receiver Christian Kirk, defensive linemen Robert Nkemdiche and Olsen Pierre and starting linebacker Josh Bynes. Not having the proper depth isn’t necessarily on Wilks. That’s a front-office issue, which falls on Keim. Heading into the regular season, the Cardinals had noticeable depth issues on both the offensive line and at wide receiver. And then there’s this: It will cost team president Michael Bidwill a significant amount of money to clean house and rehire a new coach and a new staff. Since coaches’ contracts are guaranteed, paying out their salaries for their two-, three- or four-year contracts could cost upward of $20 million — maybe as much as $30 million. Bidwill will have to pay for another new staff, which could be another $20 million to $30 million. That’s a lot of money for a team to pay. 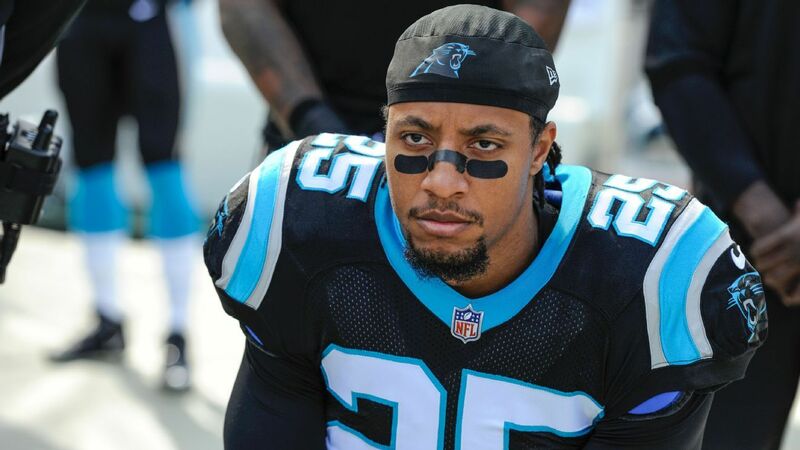 CHARLOTTE, N.C. — The NFL and NFL Players Association have asked the administrator of their independent drug-testing program to look into allegations by Carolina Panthers safety Eric Reid concerning the number of times he has been tested this season, sources from both sides confirmed. Reid said following Monday night’s loss to New Orleans he was tested for a seventh time since signing with Carolina in late September. He implied it was because of his collusion grievance against the league. The grievance was filed in May by the NFLPA on Reid’s behalf, alleging team owners and the league, influenced by President Donald Trump, colluded to prevent Reid’s employment because of his protests against social injustice during the pregame national anthem. While the NFL and NFLPA stand by their position the tests are random and they have no influence on who gets tested, they have asked that John Lombardo look into the matter with the number of tests raising eyebrows. Lombardo has been the administrator of the program for 28 years. Under league policy, 10 players are to be randomly selected from each team’s 53-man roster each week for testing. Last week, Panthers receiver Torrey Smith said he has been tested “maybe three” times since the season began, including the test every player takes at the start of training camp. Reid, the first player to join former San Francisco 49ers quarterback Colin Kaepernick in kneeling during the anthem, continues to pursue the grievance. He also continues to kneel during the anthem. Reid’s attorney and the NFLPA, sources told ESPN.com previously, are looking into the matter. Reid’s grievance is scheduled to be heard after the season. While there isn’t a lot he can say now, Reid made it clear he and his representatives are “taking notes” about everything that has happened the past few months. Reid also has suggested his four fines and ejection have been part of the league targeting him because of the grievance. He could face another fine after Sunday’s loss to Atlanta in which he was called for a personal foul. The Washington Post initially reported this request to Lombardo.